Darrell Mohr, Owner of Mohr's Floors has over 40 years of experience in flooring installation and sales. Mohr’s Floors is a flooring and carpet store that is locally owned and operated. Owners Darrell and Shelly Mohr started Mohr’s Floors in 2005. Darrell Mohr has been in the floor covering business for over 40 years. With experience in both residential and commercial floor covering products and installation, Darrell has built a solid reputation of professionalism, quality, and attention to detail. 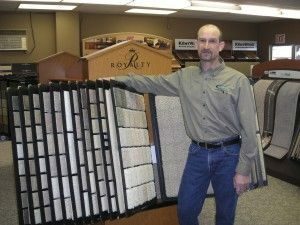 What separates Mohr’s Floors from other floor covering and carpet stores is Darrell’s knowledge of how the products need to be installed in a variety of applications. Many stores simply sell floor coverings, but at Mohr’s Floors we’ll help you find the products to suit your specific need and lifestyle that will give you the most value for your dollar. So whether you’re building or remodeling your home or business, or just carpeting a bedroom, come to Mohr’s Floors — Where Experience Matters is the right choice for the best products, service and installation.